Heathrow Airport, Commercial team conference, November 2014. LONDON, 2017-Oct-04 — /Travel PR News/ — After six successful years at Heathrow, Chief Operating Officer, Normand Boivin has chosen to leave the business for personal reasons. Since joining Heathrow in 2011, Boivin has led step changes in the way the airport operates and transformed the resilience of its operation. 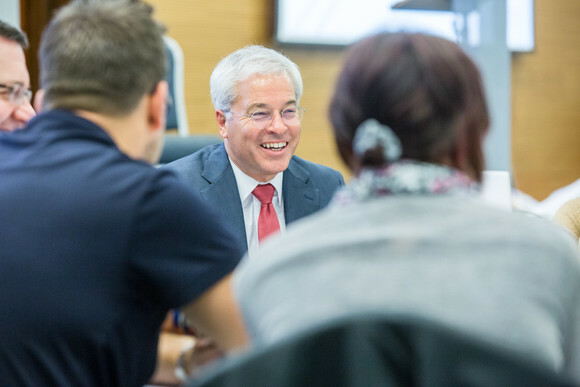 Before he joined Heathrow as COO, Boivin was on the panel which recommended the opening of a central operations centre to improve the airport’s resilience and since joining Heathrow, has made that a reality. The operations centre’s collaborative approach to the management of the airport combined with Boivin’s focus on passenger satisfaction has played a significant part in Heathrow’s position as one of the world’s top 10 airports. While the Board commences the process to select a new COO, Derek Provan will step into the role of Interim Chief Operating Officer, effective immediately. With 20 years of experience in aviation, Derek joined Heathrow from Aberdeen Airport where he was Managing Director. He has held various senior operational roles, most latterly as Director, Future Heathrow. Heathrow is Europe’s largest airport and one of the world’s top international aviation hubs. As the UK’s global gateway, Heathrow welcomes more than 76 million passengers every year with a commitment to making ‘every journey better’. The airport is home to more than 80 airlines and is Britain’s largest cargo port, helping to drive British trade growth by connecting the nation to more than 190 destinations around the world. Following an investment of more than £11 billion over the last 10 years, Heathrow is currently ranked by passengers as the ‘Best Airport in Western Europe’ for the third year running and the ‘Best Airport for Shopping’ for eight years in a row. For more information please contact the Heathrow Press Office on 0208 745 7224. This entry was posted in Airports, Business, Travel, Travel Management and tagged Derek Provan, heathrow airport, Normand Boivin. Bookmark the permalink.